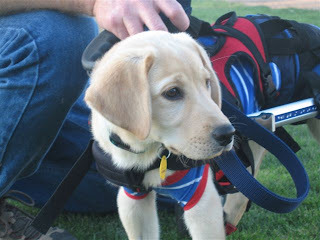 Several people have asked about Bella, a paralyzed golden lab puppy featured in our July 22 blog. Amy Shever, founder of 2nd Chance 4 Pets, contacted Gina Farnsworth at the end of July and offered to take Bella. 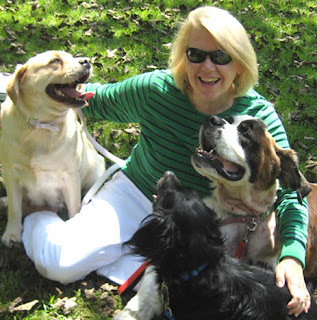 Her organization's mission is to "protect animal companions and prevent them from becoming orphaned due to their owner’s death or disability." 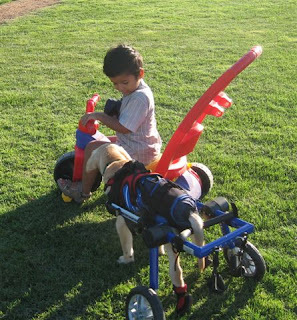 While at 2nd Chance, Bella was evaluated, fitted with a special cart and given therapy. On August 18 she arrived at her new home at Healing HEART Sanctuary in Kanab, Utah near the Best Friends Animal Sanctuary. 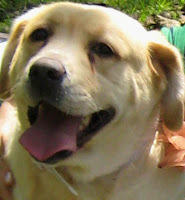 Bella was filmed by a local video crew and later was guest of honor at a Best Friends weekly staff lunch. Bella's condition is complicated. On Friday, August 7, she had an emergency procedure done, a consequence of her neurological issues. She will need ongoing care. 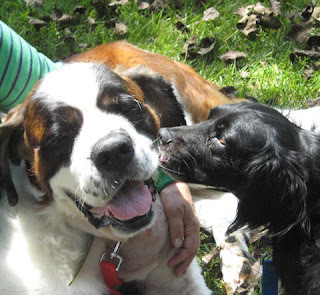 To continue treatment at Healing HEART, Bella will depend on 2nd Chance 4 Pets. 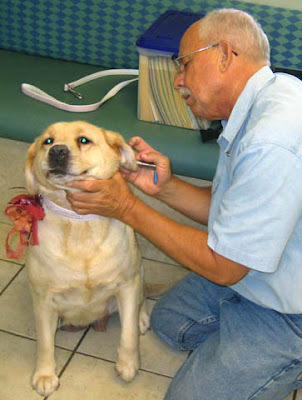 Guardian angels are needed to underwrite the cost of Bella's treatment as she grows. 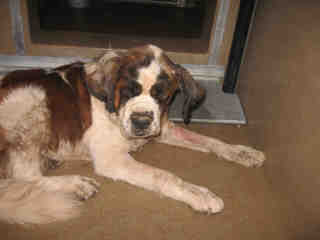 If you can make a donation, please visit www.helpbella.org. Donations can be made online at www.2ndchance4pets.org or can be mailed to 2nd Chance 4 Pets BELLA FUND, 1484 Pollard Rd, No 444, Los Gatos, CA 95032O. 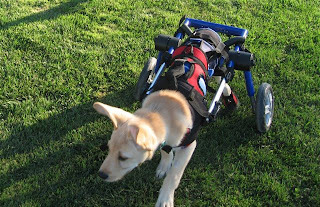 You can see a video of Bella in her new cart and follow her progress on Bella's Blog. 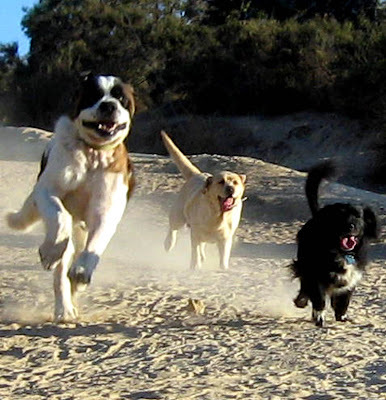 Shelter Dogs Barney (8), Lara (2) and Ollie (5) Take Over Encinitas! Yes, this is the same Barney who was infested with maggots 3 weeks ago. Scroll down to the August 12 post below to see his progress. Thanks to all the rescue volunteers and donors who made their rehabilitation possible. They were worth it, and so are others! Thanks to Tiffany Porter of Encinitas for this wonderful sentiment. It came to her from her nephew, a dog trainer. 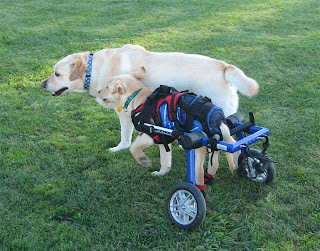 Take a moment today to thank God for your pets. Enjoy and take good care of them. We do not have to wait for Heaven to be surrounded by hope, love, and joyfulness. It is here on earth and has four legs! Last weekend Joey asked if I had ever thought of becoming a vet. "Yes, I thought of it," I replied. "In fact, my high school science project was about dog parasites." So he posed the next logical question -- why then hadn't I gone to veterinary school. "I didn't like science," I said. Truth be told, it wasn't one of my strong suits either. 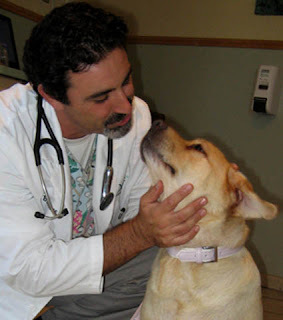 Fortunately for those of us who love our pets, there are gifted practitioners who not only excel in the sciences, they possess compassion and an instinctual understanding of their patients. 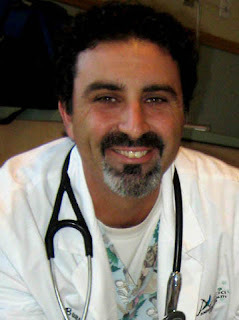 These are qualities I've come to appreciate in Dr. Carmine Bausone, director of integrative medicine at the Acacia Animal Health Center. Last week I arrived at our appointment with a list of concerns to discuss. The first was raised by Mike Dougherty who, during Lara's grooming, suspected that she had the beginning of an ear infection. Before I had a chance to address my list I watched as Dr. B greeted Lara, then remarked, "She has an ear infection. . .I can smell it." The other thing I like about Dr. B is that he offers a spectrum of treatment options, drawing upon his knowledge of traditional western medicine, holistic healing and eastern therapies. Thoroughly mix drops* of Nutrabiotic Grapefruit Seed Extract with a mixture of ½ oz. apple cider vinegar and ½ oz. water. Apply 3-5 drops of solution in the affected ear 2 times/day. Do not use full strength in ears and use as often as needed. * 3-4 drops small to med., 4-7 drops med. 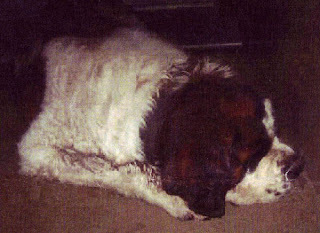 to large, 7-10 drops larger dogs. Caution: This treatment may not work in every case. 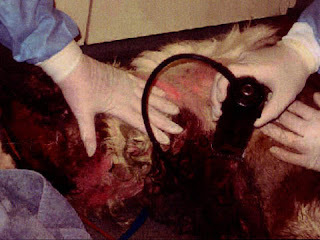 Monitor your dog's ears closely. 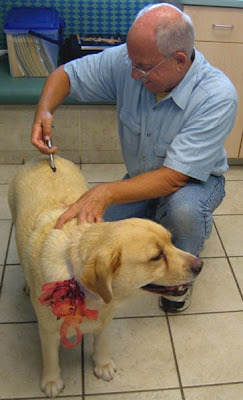 If they do not heal completely visit a veterinarian right away. We also discussed commercial products and home remedies for flea control and removal of the tear stains beneath Lara's eyes. After performing acupuncture, Dr. B said her condition had stabilized to the point where she only required monthly maintenance treatment. During her weigh-in we learned that Lara had lost another 5 lbs. -- bringing the total to 15. Only 12 lbs. to go! The good news continued a few days later when Dr. B called to report that blood test results indicated that her thyroid was normal. Under Dr. B's care, this little girl has transformed from a sad victim of neglect, who collapsed halfway around the block on our first walk, to a robust young lady who is now running, playing and living the life of a San Diego water dog -- also kayaking and swimming!